We’ve spent all of October helping you make the most of your online marketing channels. By now you should be excited about using your social media to promote your newest products, your website should be refreshed and ready for your customers to start making their list starting at your doorstep. We’ve read lots of studies and articles that tell us that eCommerce is not killing brick and mortar retail, but it is forcing it to transform. Breaking news in retail is that Sears is bringing back it’s holiday catalog after a 6 year hiatus, but even the harbinger of holidays has an online complement to meet the demands of the modern shopper. Once you’ve updated your business site and talked up your in-store shopping experience on social media, you’ve got them where you want them--almost. They’re coming to your store and they want, no, they need to know they’ve come to the right place (which is what you’ve been telling them online). What can you do to make sure they clearly understand the transition from the touches they’ve had with you online will relay into the store? Of course, we’re biased, but we think Digital Signs are one of the best ways to quickly show your online customer that they have found what they came looking for. 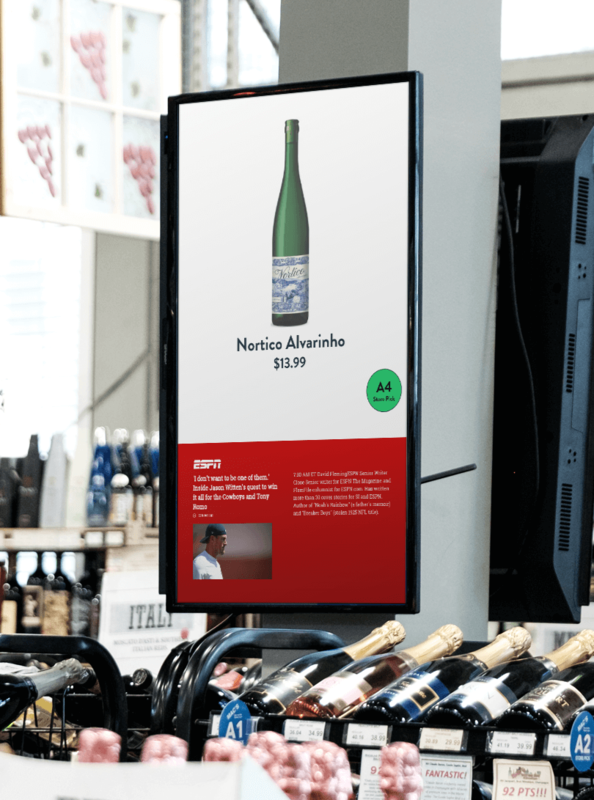 The Sellr Content Library contains more than 135,000 products with images and product information that is used both online and on in-store digital signage. Nothing says “you’ve arrived” like an overhead sign with the same image you saw online prominently displayed inside the store that promised the product. Besides being an instant confirmation for your customer, digital signage also helps to draw them into your store, granted, it’s hard to ignore a large sign that has just what you’re looking for on it. Digital signs are an important part of a customer experience. Your new customers are not familiar with your store. Getting lost in everything you have to offer is easy to do. While this may be preferable, remember, the holidays are busy and people want to get in, get out, and get on with their already tightly packed schedule. Digital signage can help guide customers right to where they need to be. Sure, we want to help the customer get what they need and get on with shopping, but that doesn’t mean you can’t (and shouldn’t) give them something to consider in their time with you. In-aisle Interactive Tablets allow the customer to get information about the product they came to find with the scan of the product barcode. While what they came for might be good, tablets can help them understand benefits of the product in consideration or recommend another product that might be a better option or would make a nice compliment to the item. Does this sound like the job of your sales staff? It is, but, let’s be honest, your staff can’t be everywhere at once so having that initial opportunity to engage and educate the customer is a great way to keep them in the aisle and making purchase decisions. Speaking of your employees, interactive tablets are a great way to help your seasonal employees learn the lay of the land. It’s hard enough for regular employees to keep up with your rotating stock (and what they don’t know, they can learn while helping customers! ), but this is even harder for your new trainees. Interactive tablets also make it easy to learn about new and seasonal products that even the most senior employee in the store may not be knowledgeable about. We want to empower brick and mortar businesses, especially during the holiday season. Online engagement is great and very important, but it is only successful if you can bridge the experience to bring the customer into your store. Creating a familiar message and being useful, both to employees and customers, is a sure way to make a good impression. Your loyal customers will be impressed with your up-to-date knowledge and new customers will appreciate your commitment to service. Continue to stay with us through the holidays. Next month we will discuss the advantages of Digital Signage in helping holiday shoppers and in December, we’ll be looking at how online and in-store customer experiences help increase the lifetime value of your customers once the bows are untied and the ball drops. Simplify selling with Sellr. Click here to learn more. Renee Clare-Kovacs is the Content Marketing Strategist at Sellr. She is passionate about creating digital marketing strategies that help business owners develop successful relationships with customers and vendors. I’ve Got News(letters) For You!